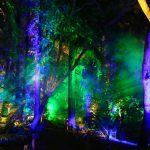 In what seems to be becoming a Los Angeles winter ritual, “Enchanted: Forest of Light” has returned to Descanso Gardens for the third consecutive year. 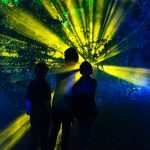 “Enchanted” is a light exhibit, much of it interactive, with a wintertime theme. 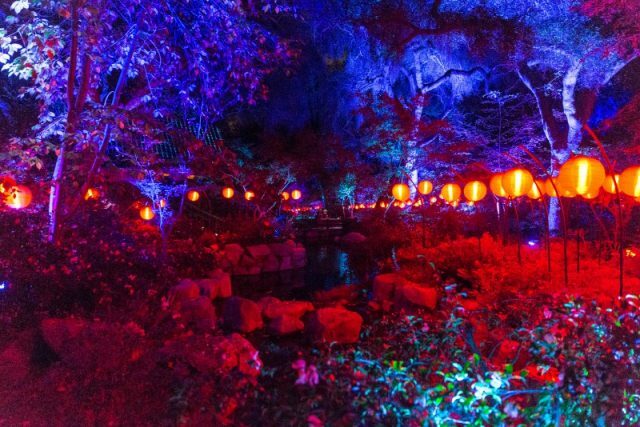 Nestled in La Cañada Flintridge and open since the ’50s, Descanso Gardens is renowned for its huge camellia collection and oak forest, amongst other horticultural charms. 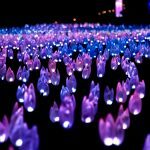 The “Enchanted” attraction is a mile-long evening stroll featuring light experiences and photo ops galore, including a field of over 2000 twinkling, lit-up “tulips,” a Japanese garden bestrewn with illuminated lanterns, a glowing oak grove and more. 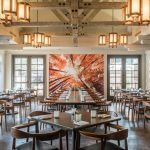 While you’re making your way through “Enchanted,” offset the chill at the new whiskey bar. Serving from an Airstream, the bar offers dozens of whiskeys from around the world and seven different whiskey flights, along with signature cocktails, beer, wine, hot cocoa and cider. Maple, the restaurant at Descanso Gardens, is offering a new dinner menu created especially for “Enchanted.” During a recent press tasting, my taste buds were particularly titillated by the whiskey short ribs (served with garlic mashed potatoes, glazed carrots, edamame, wildflowers, and whiskey jus) and the Maryland fried chicken, accompanied by blue crab-stuffed beignets and dirty rice sausage. The toast topped with roasted beet, pumpkin mash, cashew cream, toasted pepita, and fresh herbs, or the foraged mushroom toast, is a great way to start your meal, as is the winter garden salad, featuring kale, roasted kabocha squash, chickpeas, pomegranate seeds, toasted hazelnuts, Humboldt Fog cheese, and poppyseed vinaigrette. candied nuts, and chantilly crème. Raise a glass to the season with a glass of champagne or a cocktail like the Spicy Buck (Casa Noble Reposado tequila, jalapeño, lemon juice, simple syrup, ginger beer, and bitters). A true winter wonderland, “Enchanted” is open nightly (other than Christmas Eve and Christmas Day) from 5:30 to 10pm, through January 6. GA adult tickets $28.00. TICKETS. All outdoor images by Cal Bingham. Images courtesy of Descanso Gardens. This entry was posted in Attractions, Cocktails, Beer & Wine, Food and tagged Chef Philip Mack, Descanso Gardens, Enchanted: Forest of Light, La Cañada Flintridge, Maple restaurant, winter attractions. Bookmark the permalink.